Every harmonica track on Richard Hunter’s 21st Century rock harmonica masterpiece “The Lucky One” (and there are lots of them) was recorded with an Audix Fireball V mic through a Digitech RP500 straight to the board. Check it out! 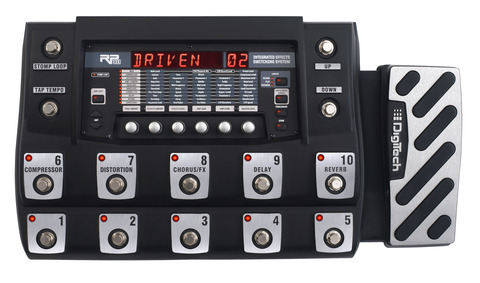 There’s no more economical way for a harp player to add a huge assortment of high-quality sounds to a stage or studio setup than a Digitech RP with Huntersounds patches in it! Start with a half dozen each of great reverbs and great delays—as good or better than dedicated reverb or delay units costing as much or more than an RP device. Add amplifier and cabinet modeling based on dozens of well-known amplifiers, pitch and modulation effects, distortions, and more. You get the picture: this thing rocks. But out of the box, it’s set up for guitar, not harmonica, and it’s not easy to figure out how to make it work for harp. That’s where we come in. Click here if you’re ready to order! What’s a Huntersounds patch set for Digitech RP? Richard Hunter’s Huntersounds patch sets for the Digitech RP series devices turn your Digitech RP 150, 155, 200/200A, 250, 255, 350, 355, 500, 1000, or 360 into an incredibly powerful harmonica setup for stage and studio. You get dozens of “patches” (pre-configured sound setups) for your Digitech RP 150, 155, 250, 255, 350, 355, 500, 1000, or 360/360XP in both single patch and bulk load format, ready for loading into your RP via a USB connection to your computer. (Note: the RP200/200A have no USB connection, so patches have to be entered by hand; we supply a spreadsheet that contains all the settings.) These are EXACTLY the same sounds used by Richard Hunter on his recordings and performances, and they cover everything from simple reverbs and delays only to massive amped blues and rock sounds, with and without a range of ear-catching effects like vibrato, rotary speaker, and pitch-shifting. You can download a complete current layout and description of each of our latest patch sets for Digitech RP250/255/350/355/500/1000/360 by clicking on one or more of the links below. Check out these rave reviews by world class stage and studio pros Rob Paparozzi and Steve Baker, this total thumbs-up by Australian harp guru Tony Eyers, and these raves by more of the musicians using our RP patch sets on stage and in studio! Also check out this live video of Steve Baker in performance with his band Opportunity, where he’s playing an Ultimate 57 mic through the Digitech RP255 running my patchset. Want more? Take a listen to our RP150/155 patch set samples! This is the low end of our patch set line, and we think the thing sounds amazing. Still more, you say? How about samples of all the patches in our latest RP250/255/350/355 set. Dat’s all we got, man, hope it’s enough for ya… Actually, just about every piece I’ve recorded anywhere in the last few years came through a Digitech RP first, so if you want to hear more of the RP in action, check out my recordings at this site. Each patch set ships with a full set of documentation that describes every patch in the bulk load set, with single patches organized by sound category (such as FX, Blues, Clean, Pitch, and so on). All sets ship with a full set of instructions that tell you how to load the patches into your RP and set the RP up for performance. The entire collection of patch files weighs in at less than a megabyte, so it will download easily even on a dial-up Internet connection. All buyers also get a year of FREE updates to the patch set, meaning that every time we add or update a patch in the base set during your first year as a licensee, we send it to you. (NOTE: as of October 2015, we are no longer developing new sounds for the RP 150/155/250/255/350/355, all of which have been discontinued by Digitech. We will continue to sell and support our current patch sets for these devices.) Finally, we provide email support for our users. Our goal is to get you up and running with your RP, making great music, as quickly and easily as possible. 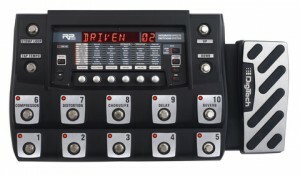 Q: Which Digitech device should I buy? 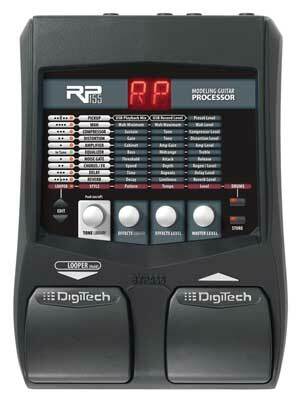 In terms of functions and features, the RP1000 is the biggest and baddest device Digitech makes. However, it’s also Digitech’s largest and heaviest (10 pounds, 19.5 inches wide), least portable, and most expensive device, and its output is extremely hot, meaning that you need to be careful about setting the master volume level when you connect to an amp or PA. We’ve addressed the output level issues in our v18 patch set for the RP1000, and there’s no question that the RP1000 sounds great. they have better control for high treble frequencies, which is important for harp. they have more amp, cabinet, and effect models, and some of these are great for harp. the RP360XP and RP500’s onstage performance features are superior to the rest of the RP line. 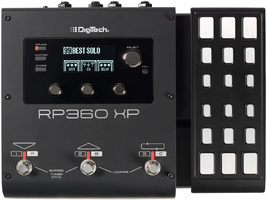 The RP360/360XP is Digitech’s latest amp modeler, and it definitely sounds better than any other RP–more colorful, more detailed, more ear-catching. But the RP500 is very close in terms of sound quality, with little or no audible difference most of the time, and all the same amp models, FX, and programmable parameters (though the RP500’s order of FX is fixed, and a 360 can put any effect in any order). The 500’s many dedicated footswitches make it better suited for live performance than the RP360/360XP, particularly if you (like us) find yourself changing tones frequently, especially in the middle of a song. If you want to perform with the unit and have the space onstage and in your carry kit for an RP500, that’s what we’d go with; in fact, it’s what we do go with whenever we can. As of October 2015, used RP500s in good-to-great condition are selling at guitarcenter.com in the neighborhood of $150, and new for $200; those prices are just about equal to the new and used prices for the RP360XP. Like we said before: every harmonica track on “The Lucky One” was recorded with an Audix Fireball V mic through a Digitech RP500 straight to the board. Check it out! If you’re going with the 360, we strongly recommend that you pitch in the extra $50 for the 360XP–once you’ve heard what you can do with the expression pedal in the 360XP, you’ll wonder how you ever managed to perform without it. Our third choice would be an RP355 or a used RP350, which has almost all the features of the RP355. Both devices sound very good, and they offer a lot of amp models and FX that you don’t find in the lower models. 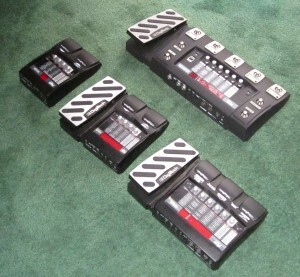 Both have been discontinued by Digitech, but can still be serviced by Digitech dealers. Sound-wise, the RP350 is identical to the RP355, except for the few additional amp, cabinet, and FX models in the 355 (not that those few are necessarily insignificant). If money is short and you want almost everything you can get in a 355, a used 350 offers lots of bang for the buck. However, with used 355s going for much less than $100 as of this writing, I’d probably look there first, knowing that the device would be at least a few years newer than a 350 (and knowing also that the 355 has the incredible FX25 autowah model and Digitech BlackBass amp model in it). 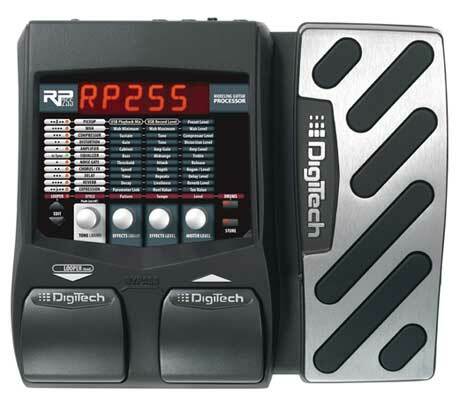 UPDATE: As of October 2015, Digitech has discontinued the RP355, RP255, and RP155. Parts will still be available for years, of course, and plenty of used devices will be out there at attractive prices for pieces in good to great condition, if you want one for a primary or backup–and of course you can load my patches into any of these devices anytime. All of these RPs remain good choices for performance tools and outstanding choices for recording tools, but we do not develop new sounds for discontinued devices. That said, we expect that our current patch sets for these devices will remain best-in-class, and we will certainly make them available and support them for the foreseeable future. If money (or space onstage) is tight, an RP255 or 250 will work fine. They don’t have every last one of the cool amp models and FX from the RP350/355, but they’ve got all the ones we use for our patches most often, AND an expression pedal, which is the most important hardware feature of the RP350/355. We’ve used our RP255 on gigs and in the studio with fine results; we actually recorded harp tracks for the BBC’s big-budget series “Copper” with our RP255. Finally, if you’ve got an RP200 lying around and you want to make use of it, go for it. It has no USB connection, so you have to enter the patch data by hand (which takes an hour or so), and you can’t use it to record directly to your computer, which you can do on any of the other RPs. (An RP with USB is a big bargain just for that 24-bit computer audio interface.) That said, it certainly sounds good (except for the reverbs, which are just barely good enough for live work). Just keep in mind that if the thing breaks (which happens sometimes with a chip-based device that went out of production over ten years ago), you’re going to have to re-enter your patch data by hand into another RP200 if you want to keep using those sounds. Trust us when we say that the USB connection with the newer RPs pays for itself fast if you’re in that kind of situation. a microphone. You can use any mic you like with an RP; anything that works with a “real” amp will work with the RP, and the sounds you get through the RP with a given mic are going to be similar to the sounds you get with the same mic and a “real” amp. (RPs are real too.) That said, the mic you want is the one that will work in the style(s) you want to play. Many of our customers get very good results for blues and rock with bullet-type mics, and we like the sounds we get with our Shure 545SD stick-type vocal mic and our Bottle o’ Blues mic too. I mostly use the Audix Fireball, because it sounds great on a lot of different styles and with lots of different RP patches; it’s not tops for hard blues, but it’s good enough, and it’s the best for just about everything else. Check out this page for audio samples of an amped-blues RP patch with three different mics. In other words, lots of mics will give you good sounds with the RP–though of course different mics sound different, just as they would with any amp. As an example, Steve Baker sounds pretty damn blue in this clip playing his bullet mic with CR element through an RP255 and our patch set, don’t you think? an inline lo-z to hi-z transformer if your microphone is a lo-z mic. If you use an inline transformer to connect your mic to an amp, or if your mic connects to the PA using an XLR cable, you will need an inline transformer to connect it to the RP. Every once in a while we get an email from one of our licensees that says “I plugged the mic into the RP, and I can barely hear it.” That’s a pretty good sign that you need a transformer between the mic and the RP. an amplifier of some sort to amplify the output from the RP. If you’re using the FX-only version of the patches (no amp modeling), then this is your favorite harp amp. If you’re using the patches with amp modeling, you’ll get the best results with a clean amp like a PA system or keyboard amp. We also recommend an amp with at least a 10″ speaker in order to reproduce the bass frequencies the RP puts out. 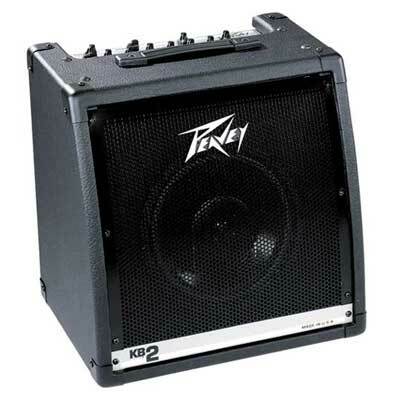 Our current favorite amp for pairing with an RP is the Peavey KB2, which has a nice set of features (like a built in 3 channel mixer), enough power to play a lot of gigs (and a line out for those gigs where you need to bring the PA into the picture), weighs around 35 pounds, and costs around $250 new. You can read our review of it here. If you can’t find a KB-2 or other keyboard amp you like, there are plenty of other options. We’ve played through powered PA speakers from Mackie, Peavey, and others that sound great. Peavey offers a powered PA speaker with a 12″ woofer, 100 watts of power, and three inputs with individual volume controls for about $340. Mackie offers a very nice speaker with similar specs for about $300. Again, look for something with at least a 10″ speaker and 100 watts of power. A powered PA speaker (or two for a stereo setup) and an RP is a powerful, versatile, and lightweight setup for most gigs. at least one 1/4″ guitar cable to connect the RP to your amplifier. For stereo, which sounds really great on effects like the rotating speaker effect, you need two cables, both either 1/4″ or XLR (and of course you need at least a pair of inputs on your amp or mixer, ideally inputs that can be sent to left and right speakers so you can really hear the stereo). access to a computer so you can load the patches. A PC running Windows XP or Windows 7-8, or a Mac running OSX, is required. Please NOTE: Mac OSX Mountain Lion is supported by Digitech as of this writing (May 5 2013); we don’t know about earlier OSX versions, Lion in particular. As of December 2018, Digitech tech support advises that the Nexus application needed to load patches on an RP360/360XP isn’t guaranteed to work on Windows 10, and recent reports from our patchset licensees indicate that Nexus indeed has problems on Windows 10. If you have any doubt as to whether your Mac or Windows OS is supported by Digitech, contact Digitech tech support. We supply both bulk load and individual patches in both PC and Mac formats. PLEASE NOTE: in order to use our patch sets, you will need to extract the patches from a ZIP file, and download and install the Xedit or Nexus (for the RP360) application and the drivers for your RP device (as appropriate) from Digitech.com. (No drivers are required for the Mac–it just recognizes the device.) If you’ve ever installed any kind of software on your computer before, then you probably know how to do this. If not, then you need to get someone to help you. Anyone who’s moderately skilled in using their computer should be able to guide you through the process, which takes less than 10 minutes if you know what you’re doing. WE DO NOT PROVIDE BASIC COMPUTER SUPPORT. You do NOT need an external preamp for input to the RP. The RP will work fine with a mic at the input. You do NOT need a direct box (DI) to connect the RP to your amp or PA unless the cable run from the RP is longer than 50 feet (20 meters). 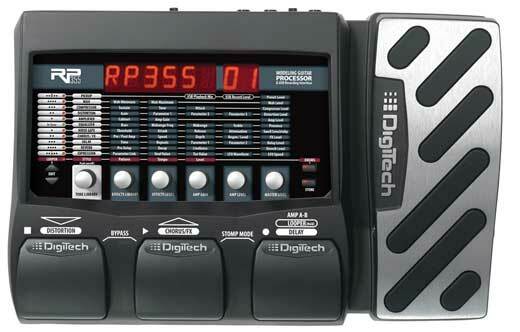 Q: Can the patches be converted to work with other Digitech devices, like the RP80, RP200, or Vocal 300? 1) It’s a violation of your license to use the patches, which is specific to the device you ordered the patches for. 2) You won’t get your year of free updates for the other device, so you’ll have to do conversions every time we send out a patch update. 3) There is no way to do an automated bulk load conversion from one device to another, so you’ve got to do the conversion patch by patch, which takes lots of time. If you’d like to do a crossgrade from one device to another, contact us. We offer discounts to licensees who want to use our patches on different types of RPs. A: You name it. We supply patches in this set for just about every purpose, and we have played rock, folk, acoustic, blues, jazz, and wedding gigs with these patches. For most gigs, all you’ll need to do is bring the RP, your mic, and a couple of cables, and plug straight into the PA. It’s great for musicians who travel on planes–you can throw your entire rig into a shoulder bag and know EXACTLY what you’re going to sound like when you get to the gig. Q: How do I record using the RP? A: See this: Three ways to record with your RP. We’ve used all of these techniques at one time or another with good results. Recording with the RP in general is easy, whether you’re recording into a dedicated recording device or a computer, and tracks recorded with the RP sound great. A: Contact us via email, if you need help with our patchset, and we’ll give you whatever help we can. We’ve also found Digitech tech support (support@digitech.com) to be very helpful and responsive; in fact, in our opinion they’re the best user tech support team we’ve ever encountered. Ready to buy? Choose the patch set that’s right for your RP below!